Long before the age of video games, slot cars occupied the time of young boys around the world. 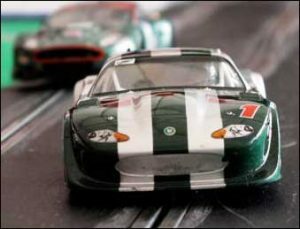 A slot car is an electric toy racing car that runs on a grooved track. The strength of the electric current used determined the speed of the car. Slot Car racing was a part of British culture, but it was not until the fad hit the United States in 1965 that its popularity really exploded. Fanatics build their own cars as well as tracks that were often multilevel, landscaped, and even had their own pit areas. Lovers of the sport could either play in their own homes on a tabletop, or play in lavish racing centers across the country for about $1.50 per hour. All good things must come to an end, and the immense popularity of slot cars diminished abruptly. The slot car explosion slowly started to “ride into the sunset” around 1967 and has never achieved the same scale of a following since. Thank you for visiting the Bad Fads Museum. This site was created to take a fun and nostalgic look at fashions, collectibles, activities and events which are cherished by some and ridiculed by others. © Copyright 2019 - Adscape International, LLC - All Rights Reserved.